Before you take CSET practice test questions or review study guides, read the information below. If you understand the development of the CSET test, it’ll aide your test preparation and raise your test score. How do you keep all public schools staffed with well-trained, effective teachers when population shifts create a crisis in staffing for many schools? Should teachers be prepared primarily to teach? Or should they be prepared with knowledge of their subject? Who should be in charge of educating the teacher? A university? Or the school in which the teacher is working? How can they collaborate? What should California teachers be able to know and do in order to ensure students know and can do things considered essential in each subject area at each grade level? Should school districts assume that once a teacher earns a degree the teacher is highly qualified to teach? How often have reforms been debated (which later impacted your CSET exam)? Often. Reforms are based on an appeal to public fears of failing schools. And in some cases, “expert knowledge is routinely ignored in favor of amateur views”. In California, reforms can be tracked using a timeline. 1850–1950 Schools and districts decided on teacher competence; teacher education was not uniform. 1950–1961 State Senator Hugo Fisher called for more subject matter prep; less pedagogical prep. 1961–1965 The press, college ed. faculty and other professional organizations reacted strongly to the State Board of Education’s attempts to focus on separate subject knowledge alone. 1966–1970 The Ryan Act of 1970, moved forward by Leo J. Ryan, worked to engage all stakeholders to create well-qualified teachers. 1971–1980 The California Legislature created the very first independent standards board: the Commission on Teacher Preparation and Licensing. This helped to establish teaching as a recognized profession. 1981–1988 Many meetings produced ideas about teacher education, but there was little action. 1988–1996 The Commission’s role and responsibilities expanded. Program standards, accreditation procedures, automated licensure procedures, and credentialing practices were developed. 1996–2003 The Commission became an agent of school reform through teacher prep. A demand for teachers as a result of class size reduction, led to attention to accountability and to SB 2042 teacher preparation and initiation of a comprehensive study of basic teaching requirements for the multiple and single subject credentials – SB 1422. 2004–2010 Through controversy, the Commission survived and worked on accreditation, standard setting and revision. There was an emphasis on improved communication with stakeholders. An on-line credential application system reduced the time and paper involved in credential processing. For more detailed information, check out 2011’s A History of Policies and Forces Shaping California Teacher Credentialing at the CTC (Commission on Teaching Credentialing) and find the PDF document—all 408 pages! What Is The CSET Test? How do you keep California public schools staffed with well-trained, effective teachers? What should the teacher be able to know and do in order to ensure students know and can do things considered essential in each subject area at each grade level? The CSET test assesses an applicant’s ability to meet specific California credential requirements. The CSET tests examine applicants’ abilities in basic skills such as reading, writing, mathematics as well as specific subject matter (ex. science or physical education). There are also CSET exams for bilingual educators and out-of-state credentialed teachers for educational technology. The California Subject Examinations for Teachers® (CSET) have been developed by the California Commission on Teacher Credentialing. This organization is responsible for the nearly 360,000 teachers in the state. There are 19 members of the CTC, 15 voting members and 4 ex-officio, non-voting Members. The State Superintendent of Public Instruction or his/her designee is the 15th voting Member. The CTC contracts with the Evaluation Systems group of Pearson to help develop, administer and score the CSET. All CSET exams are criterion-referenced. That means they measure knowledge and skills according to a standard instead of measuring knowledge and skills against other test-takers. The tests are designed to measure specific knowledge, skills and/or abilities in a CSET Single-Subject for that credential. The CSET tests were defined by committees of California educators and then approved by the CTC. and CTC preparation program standards. California educators, teacher educators, and other content and assessment specialists were consulted as the materials were developed. All CSET exam competencies were then approved by the Commission. The CSET tests are offered in both computer and paper based formats. However, only computer based exams are available for CSET Mathematics, Multiple Subjects and Writing Skills. Paper based testing is available for all other subjects. CSET subset examinations I, II, and III are 5 hours in length, whether they include one subset or all three and typically start at 7:30 a.m. Subset IV is offered in the afternoon. All of the CSET exams include multiple choice questions and constructed responses, but the percentage varies depending on the subject as does the total number of questions. Contact the CTC if you have special circumstances or questions about these qualifications! Do not leave registration until the last minute! Arrive 30 minutes early. Be prepared to show one government issued identification such as a drivers license, or passport with photograph and signature in order to be admitted. If you are taking a paper-based CSET exam, then you will need several sharpened No. 2 pencils with erasers, as they are not supplied by the test center. Some CSET single-subject test, such as the Mathematics Subset II allow test-takers to bring their own graphing calculators, but staff at the center will clear the memory prior to the start of the exam. Prior approval can be obtained by Requesting Alternative Testing Arrangements, but remember: this takes time! Plan your test date accordingly! Request alternative arrangements by going to “Policies” at http://www.ctcexams.nesinc.com. CSET multiple choice test questions are scored by computer as either correct or incorrect. In order to get a passing CSET score, you must achieve the minimum score requirement each of the tests subsets which are scored separately. Tests evaluate a candidate’s performance against a pre-determined standard, not other test-takers. After you select the CSET test you need to take, choose a test location, pay fees and register, the real work begins. Before you crack open your Multiple Subject or Single Subject study guide for the CSET, read all information from the official website by Pearson VUE Evaluation Systems. Especially review all the domain and subtest specific content you’re required to know. What If I Do Not Pass the CSET? CSET test results will be available on the score report date. The report will indicate a pass or not pass for each subset and are the recommended standards of California educators along with other performance indicators. If you fail a CSET exam subset you may re-register and retake the test, however there is a 45 day waiting period for computer based exams. During that 45 days, use CSET study guides or practice tests to insure a passing score the next time! How Can I Ensure a Passing Score the First Time? Read carefully the framework for your test, called “Test Structure and Content”. Print it out. Highlight the information that puzzles you. What don’t you know? Be honest! Seek materials that specifically cover those areas. Set ample time and a quiet place to prepare to pass the CSET. How Do I find the Right Materials? It’s easy to find great CSET preparation materials once you know your CSET’s “Test Structure and Content”: the research has been done for you! CSET practice exams are some of the most effective ways to improve test scores. CSET practice questions are almost always a more potent learning device than spending more time studying (https://ies.ed.gov/ncee/wwc/Docs/PracticeGuide/ 20072004.pdf). The key is to make sure the practice exam tests the actual material from “Test Structure and Content”. CSET practice exam questions not only can improve recall, but they can reduce your test anxiety. Don’t Count on Luck To Help You Pass-The-CSET! The CSET tests are called high-stakes tests for a reason: realizing your dream of becoming a teacher rests on passing these tests. 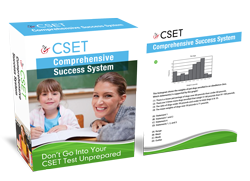 Use CSET test preparation research available to make the best use of your time and energy. Using the right CSET exam study materials is worth it! Go to: Advice To Those Who Absolutely Must Pass-The-CSET On The First Try (by current CA Credentialed Teacher). All content knowledge required by California Commission on Teacher Credentialing (CTC) for a teaching credential is listed below. This is a ‘quick reference’ California Subject Examinations for Teachers® study guide for each California Subject Examinations for Teachers.® As you prepare, return to this practice resource so you stay focused studying what the real test questions cover. The last thing you want to find on your testing date is that you studied the wrong material! Subtest I: You will be tested on plant and soil science (25 multiple-choice questions, 2 short essays), as well as ornamental horticulture (15 multiple-choice questions, 1 short essay). Subtest II: You will be tested on animal science (25 multiple-choice questions; 2 short essays), as well as environmental science and natural resource management (15 multiple-choice questions, 1 short essay). Subtest III: You will be tested on agricultural business and economics (20 multiple-choice questions; 2 short essays), as well as agricultural systems technology (20 multiple-choice questions, 1 short essay). American Sign Language: This test has three subtests. Subtest I is 90 minutes and includes literary and cultural texts and traditions (10 multiple-choice and 1 short essay) and cultural analysis and comparisons (20 multiple-choice and 1 extended essay). Subtest II is 75 minutes and includes general linguistics (10 multiple-choice) and linguistics of the target language: ASL language structures, contrastive analysis, sociolinguistics and pragmatics (20 multiple-choice and 2 short essays). Subtest III lasts 2 hours and 15 minutes and includes linguistics of the target language: ASL error analysis (1 short essay); language and communication: receptive comprehension (18 multiple-choice and 1 short essay); and language and communication: expressive production (2 short essays). American Sign Language (ASL), which covers the literary and cultural significance of ASL, as well as general linguistics, error analysis, and communication. Art Test: This exam is broken down into two parts. Each is given 2 hours and 45 minutes. Subtest I will test your knowledge of aesthetic viewing (20 multiple-choice questions and 1 essay), the historical and cultural context of art (15 multiple-choice questions and 1 essay) and artistic perception (15 multiple-choice question and 1 focused drawing question). The CSET Subtest II will assess your knowledge of creative expression (30 multiple-choice questions and 2 portfolio-based essay questions and 1 drawing question), connections, relationships and applications (10 multiple-choice questions and 1 essay) and histories and theories of learning in art (10 multiple-choice questions). Business Test: Your test prep for this examination should focus on content contained in the three subtests. Test can be taken separately (I and III are given 105 minutes; II is given 90 minutes) or together (5 hours). Subtest I will require you to know business management (20 questions) and marketing (20 questions), and you’ll need to provide two essays. Subtest II will cover accounting and finance (25 questions) and economics (15 questions), along with two essays. Subtest III will examine your knowledge of information technology (25 questions) and business environment and communication (15 questions), as well as two essay responses. English Test: This California teacher credential exam can be broken down into four subtests. Separately, tests I and IV are 90 minutes, test II is an hour and test III is two hours. Tests are 6 hours if taken all at one time. In Subtest I, you can expect to cover reading literature and information texts (40 questions) and composition and rhetoric (10 questions). Subtest II evaluates your knowledge of language, linguistics, and literacy (50 questions). Subtest III will also test your grasp of composition and rhetoric and reading literature and information texts, except you’ll have to prove it in the format of two essay responses. The final subtest covers communications (speech, media and creative performance), and has four short essay responses. English Language Development Test: This CSET has three subtests. You must register and take each subtest separately. Subtest I: 2 hours and 15 minutes; this test covers knowledge of English learners in California and the U.S. (10 multiple-choice and 1 short essay) and applied linguistics (34 multiple-choice and 2 short essays). Subtest II: 2 hours; this test covers knowledge of cultural foundations (17 multiple-choice and short essay) and foundations of English learner education in California and the United States (15 multiple-choice and 1 extended essay). Subtest III: 90 minutes; you will be tested on your knowledge of principles of ELD instruction and assessment to promote receptive and productive language proficiency (24 multiple-choice and 2 short essays). Foundational-Level General Science: The test includes 100 multiple-choice questions and 4 constructed response questions. Domains tested are scientific practices, engineering design and applications, and cross-cutting concepts (33 multiple-choice); physical sciences (23 multiple-choice) ; life sciences (22 multiple-choice); and earth and space sciences (22 multiple-choice). Each section is given its own essay. Four hours is allotted for this test. Foundational-Level Math: Two subtests assess knowledge of math. Each test is given 2 hours and 30 minutes. Subsection I covers number and quantity (10 multiple-choice and 1 short essay) and algebra (25 multiple-choice and 2 short essays). Subtest II is devoted to geometry (25 multiple-choice and 2 short essays) and probability and statistics (10 multiple-choice and 1 short essay). Health Science Test: This California credential assessment examines your knowledge through three subtests. Subsections I and II are given 1 hour 45 minutes; Subsection III is given 1 hour 15 minutes. The first of these CSET tests is devoted to the foundations of health education (10 questions, 1 essay response), human growth and development (10 questions), and chronic and communicable diseases (20 questions, 1 essay response). The second subtest will cover nutrition and fitness (15 questions, 1 essay response), mental and emotional health (10 questions) and alcohol, tobacco, and drug use (15 questions, 1 essay response). The third and final subtest will deal with family life and interpersonal relationships (15 questions, 1 essay response), consumer and community health (15 questions), and environmental health (15 questions). Home Economics Test: This standardized test is devised of three subtests. Subsections I and II are allotted 90 minutes; Subsection III is given 120 minutes. The first test will cover personal, family, and child development (40 questions, 1 essay response). The second exam will test your knowledge of nutrition, foods, and hospitality (40 questions, 2 essay responses). Finally, the third test will require you to focus on fashion and textiles (12 questions, 1 essay response), housing and interior design (12 questions, 1 essay response) and consumer education (16 questions, 2 essay responses). Industrial and Technology Education Test: To structure your CSET test preparation, you’ll want to study according to this exam’s two subtests. The first section may take as much as 2 hours and 15 minutes; the second may take 2 hours and 30 minutes. The first will test your knowledge of the nature of technology (45 questions, 2 short answers, 1 essay response). The second subtest will require you to know about power and energy (25 questions, 1 short answer), information and communication (25 questions, 1 short answer), and project and product development (25 questions, 1 short answer). LOTE: single subject, which consists of two to four subtests. These CSET tests will quiz your knowledge of a specific language, which can include grammar, writing, vocabulary, constructed responses, and short answers. Tests are offered for teachers of Arabic, Armenian, Cantonese, Farsi, Filipino, French, German, Hindi, Hebrew, Hmong, Italian, Japanese, Khmer, Korean, Mandarin, Portuguese, Punjabi, Russian, Spanish, Turkish, and Vietnamese. LOTE: used towards a bilingual authorization. This test is comprised of a subtest that covers bilingual education, bilingual cultural knowledge, and language and communication skills. Tests are offered for teachers of Arabic, Armenian, Farsi, Filipino, French, German, Hmong, Japanese, Khmer, Korean, Mandarin, Punjabi, Russian, Spanish, and Vietnamese. Arabic, Armenian, Farsi, Filipino, Hmong and Khmer, CSET Single Subject: This exam tests your knowledge with 2 subtests which use 1-3 constructed response questions per topic. There are no multiple choice questions. Subtest I includes general linguistics, linguistics of the target language, literary and cultural texts and traditions, and cultural analysis and comparisons. Subtest II tests language and communication in four ways: oral expression; listening comprehension; reading comprehension and written expression. Arabic, Armenian, Farsi, Filipino, Hmong and Khmer CSET towards a bilingual authorization: This test has 3 subtests called Subtest III, IV and V.
Subtest III tests language and communication in four ways: oral expression (2 short essays); listening comprehension (2 short essays); reading comprehension (2 short essays) and written expression (1 extended essay). Subtest IV includes bilingual education and bilingualism (12 multiple choice); intercultural communication (13 multiple choice); and instruction and assessment (25 multiple choice). Subtest V tests your knowledge of geographic and historical contexts (2 short essays); and sociopolitical and sociocultural contexts (3 short essays). French, German, Russian and Spanish, CSET Single Subject: This exam tests your knowledge with 3 subtests which use multiple choice questions and 1-3 constructed response questions per topic. Subtest I includes general linguistics (15 multiple choice and 1 short essay) and linguistics of the target language (25 multiple choice and 2 short essays). Subtest II includes literary and cultural texts and traditions (20 multiple choice), and cultural analysis and comparisons (20 multiple choice). This subtest includes 1 extended essay. Subtest III tests language and communication in four ways: oral expression (2 short essays); listening comprehension (15 multiple choice and 1 short essay); reading comprehension (15 multiple choice and 1 short essay) and written expression (1 short and 1 extended essay). French, German, Japanese, Korean, Mandarin, Punjabi, Russian and Spanish CSET towards a bilingual authorization: This test has 3 subtests called Subtest III, IV and V.
Subtest IV includes bilingual education and bilingualism (12 multiple choice); intercultural communication (13 multiple choice); and instruction and assessment (25 multiple choice). Subtest V tests your knowledge of geographic and historical contexts (2 short essays); and sociopolitical and sociocultural contexts (3 short essays). Hebrew, Hindi, Italian, Portuguese and Turkish: This California Subject Examinations for Teachers® will focus on your specific language and cover these four areas using constructed response questions: general linguistics (1 short), linguistics of the target language (2 short), literary and cultural texts and traditions (1 extended), and cultural analysis and comparisons (2 extended). There is no test offered to be used toward a bilingual authorization for these languages. Japanese, Korean, Mandarin and Punjabi, CSET Single Subject: This exam tests your knowledge with 3 subtests which use multiple choice questions and 1-3 constructed response questions per topic. Subtest I includes general linguistics (5 multiple choice and 1 short essay) and linguistics of the target language (15 multiple choice and 3 short essays). Subtest II includes literary and cultural texts and traditions (10 multiple choice and 2 short essays) and cultural analysis and comparisons (10 multiple choice and 1 short and 1 extended essay). Subtest II tests language and communication in four ways: oral expression (2 short essays); listening comprehension (10 multiple choice and 1 short essay); reading comprehension (10 multiple choice and 1 short essay) and written expression (1 short and 1 extended essay). Mathematics: If you’re taking this math exam, be prepared to encounter the following three subtests. Test-takers are given 2 hours and 30 minutes for Subtests I and II and 2 hours for Subtest III. The first will test your knowledge on number and quantity (10 questions, 1 essay); algebra (25 questions, 2 essay responses). The second mathematics test will quiz you on geometry (25 questions, 2 essay responses) and probability and statistics (10 questions, 1 essay response). Finally, the third test will try your hand at calculus (30 questions, 2 essay responses). Multiple Subjects: The three subtests in this CSET exam have both multiple choice questions and essays. Taken together the test time is 5 hours. Subtest I and II are 3 hours: subtest III is 2 hours and 15 minutes. Subtest I tests knowledge of reading, language and literature as well as history and social science (26 questions and 2 essays for each area). Subtest II examines math and science. It also has 26 questions and 2 essays for each area. Subtest III includes 13 questions and 1 essay for each of these subjects: physical education, human development, and visual and performing arts. Music: If you want to ace this test, your exam prep will need to focus on the following three subtests and their content areas. Time allotted for the subtests is as follows: subtest I is 2 hours 15 minutes; subtest II is 1 hour; subtest III is 1hour 45 minutes. The first subtest will focus on artistic perception (30 questions, 1 short answer), historical and cultural foundations (15 questions, 1 short answer), and aesthetic valuing (1 short answer). The second test will cover the content areas of creative expression (30 questions, 2 short answers using video performance) and connections, relationships and applications (10 questions). The third and final test will focus on music methodology and repertoire (40 questions and 2 short answers). Physical Education: If you want a passing score, make sure that you study for the following three subtests. Subtests I and II are given 1 hour 45 minutes; subtest III is given 1 hour 30 minutes. All three together are allotted 5 hours. The first is in two parts: growth and motor development and motor learning; and the science of human movement (both sections contain 20 questions, 1 short answer). The second subtest will deal with sociology and psychology of human movement (10 questions, 1 short answer), movement concepts and forms (24 questions, 1 short answer), and assessment and evaluation principles (6 questions). The third and final subtest of this CSET examination will deal primarily with professional foundations (16 questions) and the integration of concepts (24 questions, 1 essay response). Preliminary Educational Technology: This teacher credential examination can be broken down into two subtests. Subtest I is given 2 hours 15 minutes; subtest II is given 2 hours. The first of these two California Subject Examinations for Teachers tests will measure your knowledge of basic operations, concepts, and issues of computer-based technology (40 questions) and productivity applications of computer-based technology (30 questions, 2 short answers). The other subtest will cover teaching and learning applications of computer-based technology, which has 40 questions, 2 short answers, and one essay response. Science: The CSET Science exam consists of 2 subtests: subtest I includes areas of general science and takes 4 hours; subtest II examines the test-taker’s area of concentration takes 2 hours to complete. Subset I: scientific practices, engineering design and applications and crosscutting concepts (33 questions; 1 short answer); physical sciences (23 questions; 1 short answer); life sciences (22 questions; 1 short answer) and earth and space sciences (22 questions; 1 short answer). An onscreen calculator and a periodic table is available for use during the test. Subset II: candidates will be tested on their area of concentration. That test will include 50 questions and 3 short answers in either life sciences; chemistry (a periodic table is provided); earth and space sciences; or physics (a reference sheet is available during the test which includes constants, trigonomic functions, formulas and notes). Social Science: This California Subject Examinations for Teachers® test by the California Commission on Teacher Credentialing (CTC) is broken down into three subtests. Subtest I and II are 2 hours 15 minutes; subtest III is 1hour 45 minutes. The first of these tests will cover world history (35 questions, 1 essay response, and 1 short answer) and world geography (4 questions and 1 short answer). The second examination will test your knowledge of United States history (35 questions, 1 essay response, 1 short answer) and United States geography (4 questions, 1 short answer). The third Social Science subtest will quiz you on civics (18 questions, 1 short answer), economics (15 questions, 1 short answer) and California history (7 questions, 1 short answer). Writing Skills: The CSET Writing Skills test consists of 2 essay questions to be answered in 90 minutes. One question is expository (analysis of a given situation or statement); the second question is expressive (writing about a personal experience). You now know more about these standardized tests for California teacher credentialing. You’re armed with the focus you need to prepare. Go to: Little CSET Test Prep Mistakes That Make Credential Candidates Demoralized And Broke.